Ahmad is a jinni, a being of fire born in the ancient Syrian desert, trapped in an old copper flask, and released in New York City, though still not entirely free. Ahmad and Chava become unlikely friends and soul mates with a mystical connection. Marvelous and compulsively readable, Helene Wecker's debut novel The Golem and the Jinni weaves strands of Yiddish and Middle Eastern literature, historical fiction and magical fable, into a wondrously inventive and unforgettable tale. The Golem's life began in the hold of a steamship. The year was 1899; the ship was the Baltika, crossing from Gdansk to New York. The Golem's master, a man named Otto Rotfeld, had smuggled her aboard in a crate and hidden her amongst the luggage. Rotfeld was a Polish Jew from Konin, a northern village near the sea. The only son of a well-to-do furniture-maker, Rotfeld had inherited the family business sooner than expected, on his parents' untimely death from scarlet fever. But Rotfeld was an arrogant, feckless sort of man, with no good sense to speak of; and before five years had elapsed, the business lay before him in tatters. Rotfeld stood in the ruins and took stock. He was thirty-three years old. He wanted a wife, and he wanted to go to America. Compare the Golem and the Jinni's origins. How are their personalities reflected in their origins? How are the creatures similar, and how do those similarities draw them together? How are they different? What are their individual strengthsand what makes them weak? How do these influence their choices as events unfold? How do the Golem and the Jinni make each other better beings? What are Chava and Ahmad like when we first meet them? What about at the end of the story? How do events impact who they are and what they believe about themselves and each other? I thought the author failed to take advantage of the culturally established traits of the golem and jinni, changing their natures to fit her narrative rather than sculpting the story to fit the characters. Some aspects of these creatures that are part of long-standing tradition were dropped altogether, others merely referenced in passing. Both creatures have long histories and strong connotations in their specific cultures, and that sense of history and heaviness of meaning were lacking. The end result was that the two felt far too human and not nearly "other" enough to me. (Reviewed by Kim Kovacs). 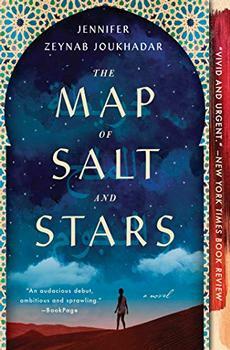 Magical thinking comes alive in an enchanting allegory of the immigrant experience as two mythical beings try to make sense of themselves and the world around them. The tale is meant to be magical, and it is, but Wecker’s real sleight of pen is recreating Manhattan as it was then. She has a historian’s grasp of detail and a novelist’s flair. History, magic and religion braid together in old New York’s tenements…The interplay of loyalties and the struggle to assert reason over emotion keep the pages flipping. An intoxicating fusion of fantasy and historical fiction…Wecker’s storytelling skills dazzle…The book’s magic, filtered through the old-time hustle and bustle of the Lower East Side, lingers long after the final page. The author makes you care enough about the humanity of these magical spirits to not only see them through to the end but also to regret that you’ve reached the last page. Wecker maintains her novel’s originality as she orchestrates a satisfying and unpredictable ending. The Golem and the Jinni is a continuous delight — provocative, atmospheric, and superbly paced. In the best instances, you don’t merely read a book -- you dive in and happily immerse yourself, forgetting the troubles of daily life for a while. The Golem and the Jinni offers just such an absorbing experience. Wecker does not disappoint as she keeps the surprises coming in this unusual story of the intersection of two magical beings and their joint impact on their parochial immigrant communities. Wecker begins with a juicy premise…and great adventures ensue…She writes skillfully, nicely evoking the layers of alienness that fall upon strangers in a strange land. From its eerie opening pages to its shattering conclusion, The Golem and the Jinni is an astonishing debut novel that sweeps us into a gaslit alternate reality rich enough to get lost in. With a delightful blend of the prosaic and the fanciful, The Golem and the Jinni explores what it means to be human as Chava and Ahmad struggle to live and find love while overcoming the powerful adversary who threatens to destroy them. 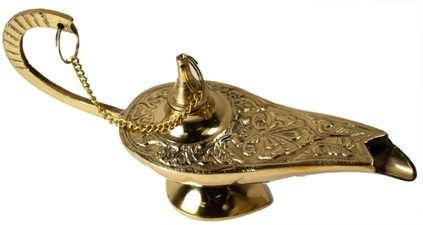 Most Westerners are generally introduced to genies through the story of Aladdin and the Magic Lamp from The Book of One Thousand and One Nights (aka The Arabian Nights). In it, Aladdin is tricked into obtaining an old oil lamp in which a jinni has been imprisoned. Through various twists and turns in the story, the jinni is released from his confinement and eventually helps Aladdin obtain his greatest wishes: wealth, fame, and the love of a beautiful princess.